SOHO-1329 C/2007 L13 2007 Jun 15 positions 8889: was stellar (mag about 5.5) in C3 images, appeared slightly diffuse with a very faint tail in C2 images. SOHO-1330 C/2007 M4 2007 Jun 25/26 positions 8889: was stellar (mag about 5.5) in C3 images, was slightly diffuse and showed a short, thin, faint tail in C2 images. SOHO-1342 C/2007 N7 2007 Jul 13/14 8892: of mag about 6 in C3 images; C2 images showed C/2007 N7 to be slightly diffuse with a very faint short tail. much like that seen in C2 images, and a tail also was seen to form in the last images obtained with the COR2-B camera on July 4.
image 8985: appeared very small and stellar in appearance, peaking at mag about 6. 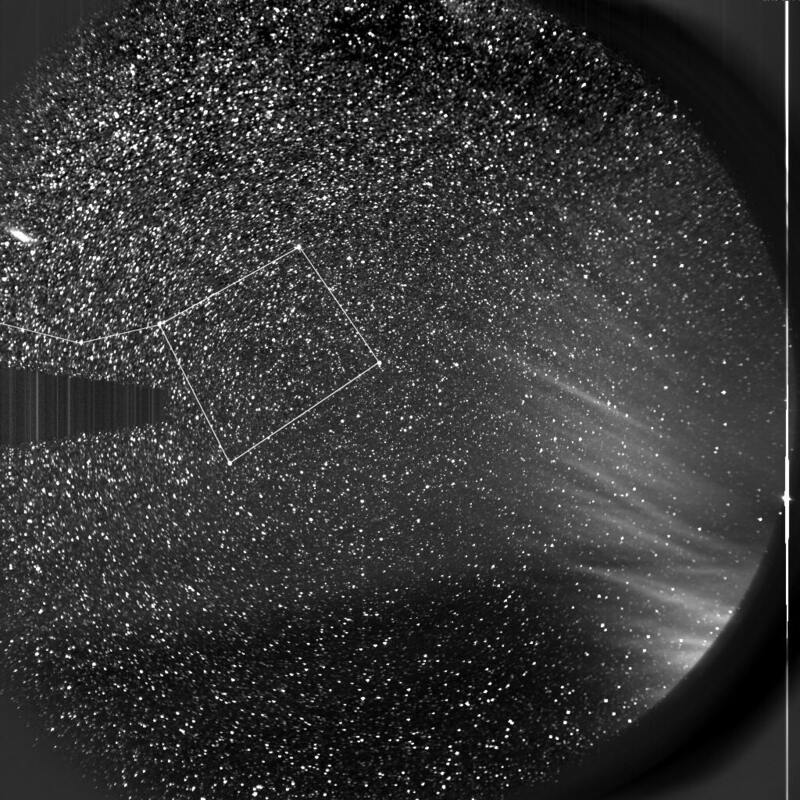 This comet was observed from the ground during a total eclipse of the sun. SOHO-1519 C/2008 P3 2008 Aug 06 positions 9003: was small and stellar in appearance in C3 images (mag about 6.5), and very diffuse, very faint, and elongated in C2 images. animation 9006: an additional near-sun Kracht-group presumed comet was found by R. Kracht on SOHO website images. C/2008 R7 was stellar in appearance in C3, C2, and COR2-A images, peaking at mag about 5.5 around Sept. 6.83 UT. SOHO-1527 C/2008-R10 2008 Sep 08/09 9011: was elongated (mag about 5.5) in C3 images, and quite diffuse with a very faint short tail in C2 images. COR2-A STEREO images show a bright starlike head and a very faint, thin tail. where the tail was > 1 deg long; in HI-1 images, the tail was several degrees long. STEREO-37 C/2010 E6 2010 Mar 11/12 9157: this was one of the brightest comets seen in coronagraph spacecraft data, peaking around magnitude 1 near Mar. 12.625 UT. SOHO-1519 C/2008 P3 2008 Aug 06 9003: was small and stellar in appearance in C3 images (mag about 6.5), and very diffuse, very faint, and elongated in C2 images. SOHO-1527 C/2008-R10 2008 Sep 08 9011: was elongated (mag about 5.5) in C3 images, and quite diffuse with a very faint short tail in C2 images. 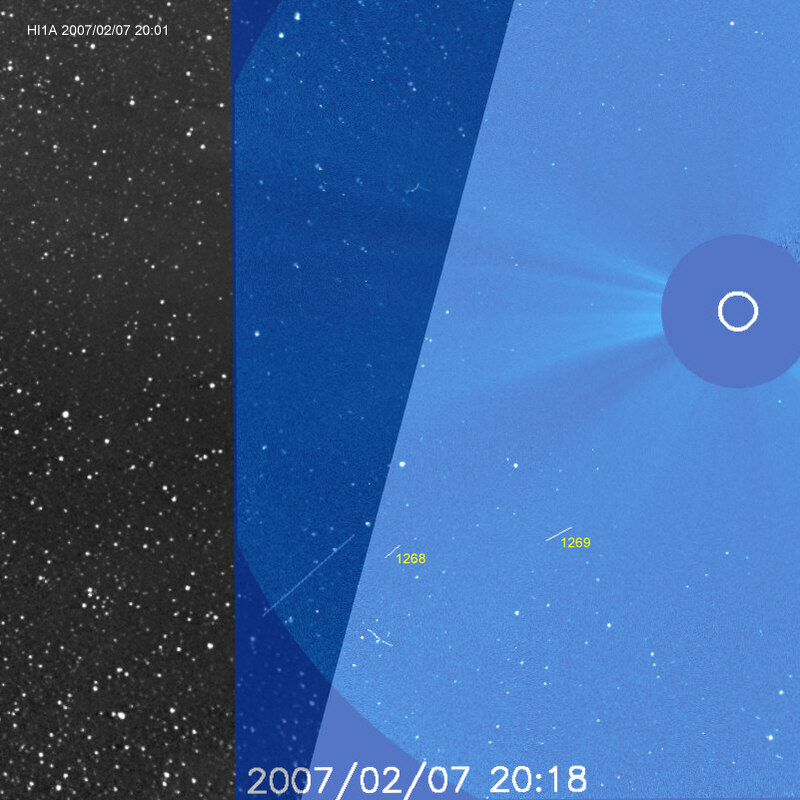 STEREO-37 C/2010 E6 2010 Mar 12 9157: this was one of the brightest comets seen in coronagraph spacecraft data, peaking around magnitude 1 near Mar. 12.625 UT. condensed, and teardrop-shaped, peak mag about 10 in STEREO HI1-A images. slightly diffuse and elongated, peak mag about 10 in STEREO HI1-A images. slightly diffuse and elongated, peak mag about 11 in STEREO HI1-A images. peaking around magnitude 1 near Mar. 12.625 UT. SOHO-2160? 2011 Oct 29 positions Oct 30 2011 06:29:18 Zhijian Xu ?? and extremely faint and diffuse in C2 images. and fairly condensed with a hint of a thin, faint tail in C2 images. when this object was found. SOHO-1708 C/2009 T8 2009 Oct 11 positions 9168: diffuse (mag about 7.5) with a "slight tail"
SOHO- C/2009 2009 Nov 05 positions 20091105 17:41:16 M. Uchina ?